2018 is the year I discovered Taylor Jenkins Reid. My third TJR of the year (after One True Loves and After I Do) was The Seven Husbands of Evelyn Hugo. This book has gotten so much love in the book blogosphere that despite the fact that I passed it up at Book Expo a few years ago, I decided I had to read it. Evelyn Hugo is a legendary Hollywood film actress in her seventies who famously had seven marriages, but remained tight-lipped about them over the course of her life. Suddenly, Hugo decides that she’s going to tell her story to the world – the truth about the marriages, the scandals and all of the drama that was suspected but never confirmed. She chooses a magazine to write the feature, and even chooses the journalist, a woman named Monique. She makes it clear she will only tell her story to this one specific reporter. But why? What is Hugo’s motivation, and how did she select this writer? The Seven Husbands Of Evelyn Hugo is about the price of fame, and specifically the cost of living up to an image that people have of you that may not be true. Hugo pays the price over and over, only learning too late that her one precious life was being wasted by her dishonesty. 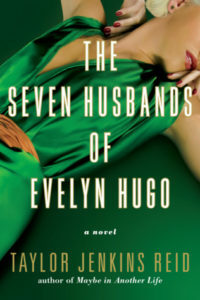 I think it would have been hard for any book to live up to the hype around The Seven Husbands of Evelyn Hugo. I liked it, but I didn’t love it. Like all of Reid’s novels, it’s immensely readable and entertaining. You get sucked in, and the pages fly by. Hugo is an interesting character, and there are several surprises along the way as she tells her story to Monique in a series of meetings in her New York apartment. But in the end this one felt a little flat for me. Things happened quickly – relationships, marriages, deaths – and it all felt rushed and shallow. It was an interesting story, but devoid of depth and detail. I enjoyed Reid’s other two books more, because they really analyzed what the characters were thinking and let events unfold slowly and meticulously. The Seven Husbands Of Evelyn Hugo is absolutely beloved among many readers and my not-as-glowing review feels like blasphemy. Don’t get me wrong – it’s an enjoyable read and I’m glad I sought it out. It just wasn’t my favorite book – or even favorite TJR book – of the year. Posted on December 5, 2018 by gayle. This entry was posted in Fiction and tagged taylor jenkins reid, the seven husbands of evelyn hugo. Bookmark the permalink.